How do you know if the event you organized was a success? For everyone? You ask! Once you’ve got your audiences’ attention, keeping them engaged is vital to prevent them from quitting the survey prematurely. Survey Anyplace enables you to create engaging experiences that have all the bells and whistles with just a few clicks. 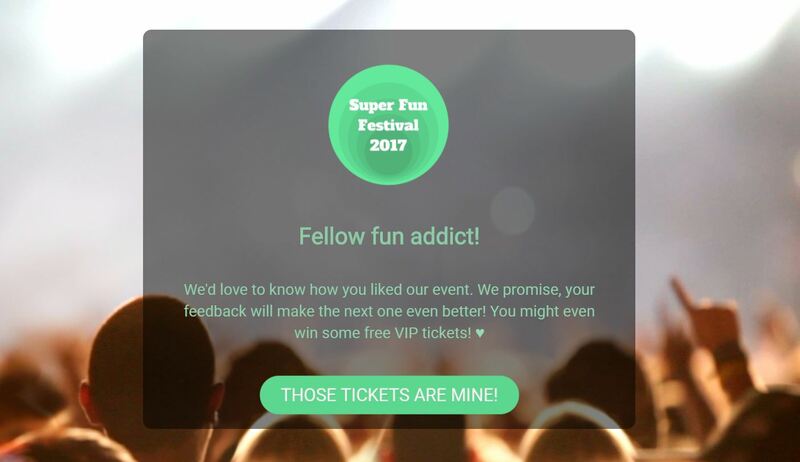 You can easily add videos, cool animations, interactive scratch cards, animated slot machines,… Anything to unbore your survey and get more and better feedback. Create a fully branded event evaluation survey with your brand’s font, logo and colors. Take it even further with our white label solution and remove any reference to Survey Anyplace. Events often don’t offer the best wifi connection. Why take a chance, when you could have your event evaluation work offline entirely? Learn how offline mode works. Avoid yes or no questions, this can lead to taking the wrong conclusions from your evaluation results. After receiving your results, use the correct benchmarks to determine how to implement change e.g. If you notice 10% of your attendees said they did not eat the turkey dinner, maybe it was because of the fact that 10% was vegetarian and not 10% did not “like” the roast. Don’t wait around. Send out your event evaluation immediately after the event. This way the event will still be fresh in the attendees’ minds, enabling them to give an actionable, detailed report on their experience at your event. Keep it short and simple. Following the KISS principle will work miracles for your response rate. Respect your attendees’ privacy. You can ask demographic questions such as age, gender, nationality etc. This will help you market to the right target audience in the future. But don’t ask things you already know or don’t need to know. In light of recent events and the go-live of the GDPR rules, it’s important to create GDPR compliant surveys. Simply select the event evaluation survey template from the template overview when creating a new survey and personalize the questions to your specific needs. Upload your logo and a single click will set our color detector at work to brand your survey with the correct colors. Quickly gather the data you need while you focus on discussing what really matters. Review results immediately within the tool and download them any time for deeper analysis, integrations into CRM or other systems. Eliminate the time lag between the event and the moment you ask participants to evaluate it. An evaluation produced during the actual experience will be of a higher and more detailed quality. 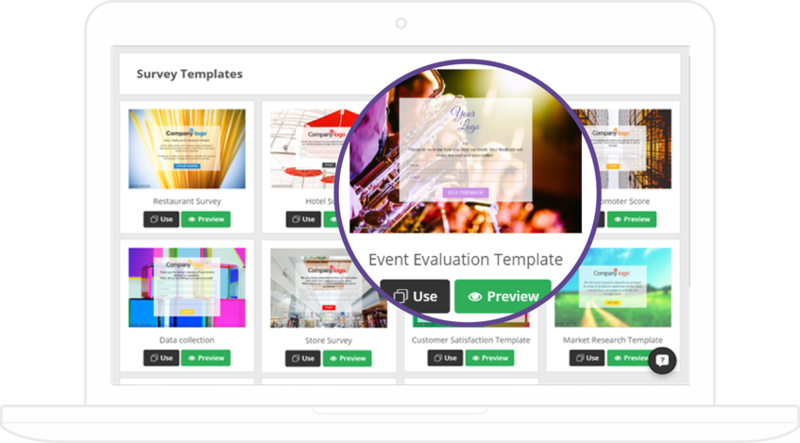 Discover our event evaluation template and create your own event evaluation today! Looking for other survey uses and templates?